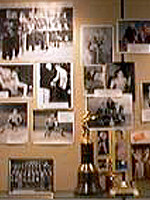 When the nation’s only wrestling museum was finally dedicated in 1976 in Stillwater, OK, it was with the idea that oldest sport in the world should have a permanent home for its culture and memorabilia. 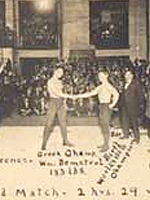 The Amateur Athletic Union served as wrestling’s national governing body for nearly a century, and was the sport’s only voice on the international scene for much of that span, but AAU events — even the national tournaments — seldom received the attention drawn by various activities of the school-college community. This became more evident after Jess Hoke launched Amateur Wrestling News in 1956. His publication was college-oriented, and the sport’s first true documentation was focused primarily on collegiate events and results. But even though wrestling interests were centered on the nation’s campuses, the school-college community and other independent organizations had little or no say about the governance, development and promotion of wrestling. As an “umbrella” organization responsible for a large number of sports, representatives of wrestling’s grass roots found it difficult to make themselves heard by the AAU. In time, this situation would lead to formation of the United States Wrestling Federation and a successful challenge to AAU governance of the sport. Discontent over the AAU’s wrestling programs became intense in the mid-1960s, after U. S. Olympic teams won only one bronze medal in 1964 and the World teams had exactly the same minimal achievement in 1965. The solution was to create a new Federation, to create new programs addressing wrestling’s major deficiencies, to gain control of the sport, and to supplant the AAU as national governing body and international representative. The initial effort was spurred by Terry McCann, a 1960 Olympic gold medalist then with the U. S. Jaycees national office in Tulsa, Oklahoma, and Myron Roderick, a 1956 Olympian who had become the nation’s most prominent collegiate coach at Oklahoma State University. McCann was Oklahoma AAU wrestling chairman and attended National AAU conventions, where he found wrestling concerns of little interest. With support from Walter Byers, executive director of the National Collegiate Athletic Association, groundwork was laid for a new organization. The NCAA was supportive of federations in several sports, but it took some three years to establish such a concept in wrestling. An exploratory meeting was held in January of 1968 at O’Hare Airport in Chicago, chaired by Dr. Al deFerrari in his capacity as USA delegate to the International Wrestling Federation (FILA). Minutes indicate that this gathering consisted largely of rhetoric from AAU leaders citing their strong ties to FILA and rebuttal from school-college spokesmen. These preliminary talks set the stage for another conference in Chicago during the summer of 1968, at which the United States Wrestling Federation was born. A joint meeting of the steering and finance committees, appointed in January, was called April 4-5 in Biloxi, Mississippi, during which the first draft of a constitution and by-laws was discussed and revised. The need for an executive director and a national office was incorporated in the finance committee’s proposed budget. A brochure was circulated in May and June, defining the goals, objectives, structure and proposed financing, and setting the stage for the official organization meeting July 31-August 1, 1968, at O’Hare Inn, Chicago, intended to involve all wrestling interests in the United States. The steering committee met on the eve of the general meeting, and decided that programs must begin at the state level, with emphasis upon the registration of athletes as members. International exchanges by schools and colleges would be encouraged, the forerunner of today’s state and national exchange programs. Clinics to teach coaches and officials the international styles were deemed imperative. A major obstacle in the planned presentation to FILA would be the folkstyle rules employed by USA high schools and colleges. Among the 29 delegates answering roll call on July 31, were 13 collegiate coaches, four representatives of collegiate conferences and five spokesmen for other school-college organizations. Two international referees were present, as well as a representative of the active athletes. Attending from the U. S. Olympic Committee were the AAU’s front line of Newt Copple and Josiah Henson, the USOC wrestling chairman. Reports of the program, structure and finance committees clearly established the philosophy that USWF would be a service organization, and that its financial base would be membership fees of individuals and organizations. The basic credo continues to apply to USA Wrestling. Wallace T. “Wally” Johnson, wrestling coach at the University of Minnesota, was elected the first president and served four years. Copple was elected vice president, but he and other AAU representatives declined office. Johnson was succeeded by Ken Kraft of Northwestern, 1973-76, and Rick Bay of Michigan, 1977-80, so for the first 12 years, the USWF president was a college coach. 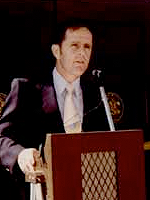 Werner Holzer, founder of the Mayor Daley Youth Foundation wrestling program in Chicago, took office in 1981 and Holzer’s presidency spanned the eventual transition from USWF to USA Wrestling. FILA did not leap at the opportunity to accept the new, unknown Federation as its international delegate, but neither was the door slammed in USWF’s face. Roger Coulon of France, the FILA president, declared before the FILA Congress that “umbrella” organizations no longer would be accepted as members, that FILA would look only to single-sport bodies. To become worthy of the international franchise and the role of NGB, the new Federation had to build a solid, grass roots organization with democratic principles. It had to become so much better than the AAU that “a preponderance of evidence” would be in its favor. It took some eight years to build such an organization, and seven more years of conflict in the United States Congress, the American Arbitration Association, the federal courts, the U. S. Olympic Committee and FILA before the goal was realized. USWF conducted its first national freestyle and Greco-Roman championships at Evanston, Illinois, in April of 1969. But without a full-time executive director, the Federation was not yet in position to make much impact. 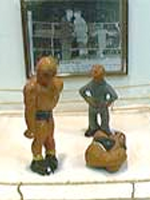 After a search which lasted through the wrestling season, the Governing Council (board of directors) turned to Roderick, one of the originators of the Federation movement. He was only 34 years old, but in 13 seasons as coach at Oklahoma State he had guided his teams to seven national championships. He was ready for a new challenge, and the Federation filled the bill. His appointment was announced in August. At Roderick’s insistence, the national office was located in Stillwater, Oklahoma. Roderick plunged into his new job with enthusiasm. Operating out of an office built in his garage, he set out immediately to establish the state federations which would be the operating base of the national organization. The man who had introduced modern recruiting tactics to wrestling now faced his biggest recruiting task ever. He coaxed his coaching colleagues into service as state chairmen, state directors and regional supervisors. Within a few months, there were state chairmen in three dozen states — some of them in name only, perhaps, but others at the helm of solid, well organized state federations. The foundation of state programs and volunteer services was laid by Roderick and a Governing Council centered on the school-college community, but with representation for all of the independent organizations involved in wrestling. By 1970, the United States Wrestling Federation had become a recognized entity. A handbook was in print, setting forth by-laws, national structure, international rules, honors for wrestlers and coaches, and a substantial amount of advertising of wrestling products and summer camps. It was mailed to more than 11,000 high school and college coaches. A national convention was scheduled March 29 in Evanston. Plans were under way to register and develop officials through rules and technique clinics. Vince Zuaro of New York, twice an Olympic referee, organized the U. S. Wrestling Officials Association. A senior team was ticketed to Europe, a junior team to Mexico. Teams from the Soviet Union and West Germany agreed to visit the United States in 1971. The logistics of membership applications and event sanctions were now in place. It was soon obvious that the USWF needed more than a one-man staff, and in 1972 Bob Dellinger was added as assistant executive director. Dellinger, 45, had been a sports writer/editor for 27 years with involvement in wrestling as a writer and as a volunteer official in tournament operations. Over the course of 20-plus years, his career with the Federation would focus on publications, events, officials, state services and the Hall of Fame. In retrospect, it is perhaps fortunate that USWF did not win the war with its first salvo. The young organization had not yet built the broad foundation upon which USA Wrestling is situated today. A sudden, short-lived international responsibility in 1971 put the Federation in a deep financial hole. An equally abrupt transition in 1982 drove the organization to the verge of bankruptcy. An unforeseen bonanza of Olympic funds from Los Angeles saved the day, and gave USA Wrestling an opportunity to grow into its responsibilities. Steve Combs, a 32-year-old high school coach in the Chicago suburbs, succeeded Roderick as executive director in 1974, and his 11-year tenure was marked by tenfold gains in membership — from 9,000 to 90,000 — and comparable gains in competitive and educational opportunities. Combs was a grass roots person who directed his energies toward strengthening the state federations and providing them educational tools in the form of books, clinics, films, video tapes and other instructional methods. Of particular note were strong emphasis on Kids’ competition, wrestling’s first series of sports science clinics, an enhanced insurance program, delivery of the Federation newspaper to the home of every member, and a simplified technique series called the Seven Basic Skills. With Combs’ blessing, the U. S. Wrestling Officials Association, greatly expanded and enhanced its nationwide series of clinics on international rules and pairing procedures. One landmark was Combs’ 1974 success in establishing a U.S. Kids Federation, which brought together a nationwide conclave of Kids programs into a national organization with the philosophy of “Wrestling for Fun and Fundamentals.” The U. S. Kids Federation soon was merged into USWF as an operating division with voting rights on the Governing Council. Within a few years, it was noted that wrestlers too young to drive a car made up more than two-thirds of the membership. 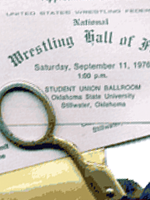 Another landmark was the dedication of the National Wrestling Hall of Fame on September 11, 1976. The inaugural class of Distinguished Members included Roderick among the 14 honorees. When the merits of USWF and AAU were compared in arbitration, the creation of the national museum was one of the strongest factors weighed in the Federation’s favor. Another such factor was the rapidly growing force of youth wrestling, both in competitive and educational opportunities. The 1977 Junior Nationals, a summer tournament for high school wrestlers in the international styles, drew a record 1,042 entries, while seven Kids regionals attracted more than 2,000. Yet while building these vital programs, USWF had not lost sight of its original goal. In November 1978, the Amateur Sports Act of 1978 was signed into law, spelling out in detail specific responsibilities of the USOC and of national governing bodies. Despite the legislation, USOC continued to bend to the influence of its strong AAU contingent, and refused to seat USWF as a new Group A member. USOC told the Federation it could not become national governing body until it had been recognized by FILA, then gave AAU $18,000 to fund a trip to Poland for the Greco-Roman World Cup. The dispute went back to court, this time with USOC as a defendant. Strangely, a federal judge in the District of Columbia ruled “in favor” of USWF, but upheld the idea that FILA should make the final decision. It was a “victory” that in truth was a defeat. The judge ordered AAU and USOC to support the Federation’s bid to the 1980 FILA Congress, but restored AAU’s international operations in the meantime. Before during and after the arbitration, USWF continued to expand its national programs, increasing its book and film productions and even taking its events onto television. More age group tournaments were added to the competition schedule and membership continued to grow. Congress amended the Amateur Sports Act to cut off USOC membership and funding for any arbitration loser, and USWF went back to court. Shortly after another record-breaking Junior Nationals, the verdict came down and it left no room for doubt. On August 20, 1982, Federal Judge Ann Aldrich ordered the WD/AAU to resign from, and sever all ties with, FILA, and to resign from the Olympic Committee. USOC was ordered to terminate its recognition of the AAU as its Group A member. William E. Simon, the new president of the USOC, convened a seven-man panel September 23 in Los Angeles to develop a structure for the new United States Wrestling Association. The panel included Holzer and Combs of USWF, 1976-80 Olympic athletes Russ Hellickson and Dan Chandler (elected by the national teams of the past three years) and Simon as chairman. When AAU boycotted, Simon appointed F. Don Miller, USOC executive director, and Steven B. Sobel, USOC secretary, as replacements. In the long run, USWF lost little more than its name. It regained organizations such as the NAIA and the Interservice Sports Council. It gained many individuals who welcomed a final solution to the struggle. It gained a whole state when the Wyoming Amateur Wrestling Association simply changed its affiliation from AAU to USWA, retaining its officers and its corps of volunteers. From both of the old rivals, it lost a substantial number of diehards who simply could not force themselves to cooperate with old enemies. The executive committee of USWA held its first meeting November 9 in New York. Holzer was joined by fellow USWF delegates Vince Zuaro of the officials, Dennis Poppe of the NCAA, Fritz McGinness of the national high school federation and Frank Rader, chairman of the state chairmen’s board. AAU delegates were to be Scalzo, Copple, Air Force Academy coach Wayne Baughman, senior Olympic referee Steve Evanoff, and Jim Stevens. Athletes were Hellickson, Chandler and 1981 world champion Chris Campbell. Evanoff, Baughman and Campbell were unable to attend, but AAU national coach Stan Dziedzic was on hand. Copple and all the AAU delegates except Scalzo walked out of the meeting after a four-hour harangue against the concept that athletes should elect their own representatives. Once in session, the executive committee established a Board of Directors, committees, policies and procedures and a national team programs, elected officers to serve until a spring meeting, and in general filled in the structure outlined by the seven-man panel in September. USWA made its first official venture into international competition November 26, sending a team to Hungary for the Greco-Roman World Cup. The AAU continued to fight through Scalzo and other members of the FILA Bureau, while Ercegan was conspicuous by his absence. Holzer, as chief of delegation armed with USOC support, refused to back down from three days of threats and arguments, and the USA team finally was permitted to wrestle. The USWA executive committee met twice more to draft by-laws and an agenda for the official organization meeting and elections, March 13-14 in Oklahoma City. Then and there, the “new” corporation would be christened with yet another name, and set before the wrestling world as the United States of America Wrestling Association, Inc. … to be known as USA Wrestling … the national governing body, a Group A member of the U.S. Olympic Committee and the international representative to FILA. Holzer was elected president, with Copple as first vice president, C. A. Patten of the University of Northern Iowa as second vice president, national Kids chairman Ben Bennett as secretary, Rader as treasurer and Evanoff as chairman of the board, a position to be filled in the future by the immediate past president. The executive committee included Hellickson, Chandler and Campbell for the athletes, Zuaro for the officials and McGinness, Poppe and Dziedzic as members at large. Cut off for so many years from international events, the federation suddenly inherited a wealth of them, starting with the Freestyle World Cup in Toledo, the Concord International Greco-Roman tournament in California. The National Sports Festival in Colorado Springs would serve as team trials for the Pan American Games in Venezuela. USA Wrestling would host a Cadet-Schoolboy World Festival in Montana, the Junior World (17-18) Championships in Oak Lawn, Illinois, and the Espoir World (17-20) Freestyle Championships in the Anaheim Convention Center, already selected as wrestling venue for the 1984 Olympic Games. And for the first time since 1971, the Federation would conduct trials and send teams to the World Championships, in Kiev, USSR. One of the strongest single factors in the transition to a new federation was the U. S. Wrestling Officials Association, now under the leadership of a plain-talking, no-nonsense president from Colorado, Don Sondgeroth. Every AAU referee and pairing official was accepted as a full-fledged member with his or her national rating intact. Members of the officials’ association already were subject to annual evaluation. Whether from AAU or USWF backgrounds, the good officials continued to advance, and less capable officials found that plush assignments for “good ol’ boys” were few and far between. Some who had been over-ranked worked hard to upgrade their skills. Others dropped out of the picture. Ahead lay the greatest spectacle in wrestling, The Games of the XXIII Olympiad in Los Angeles. Ahead, too, lay triumph and turmoil, rewarding victories and crushing defeats, insurance emergencies and a brush with financial disaster. There would be lawsuits. Arbitration cases would arise from the 1984 Olympic trials. The next five years would see six executive directors, three presidents and many changes in staff. On April 25, 1984, USA Wrestling was seated as an official, voting member of the FILA Congress, although FILA even then dissembled with a two-year “probation” that quietly expired in 1986. Tim Johnson, who had joined the USWF as director of events two years earlier, was released on six-month loan to the Los Angeles Olyrnpics, where he rode herd on more than 400 volunteers — a curious mixture from USA Wrestling and southern California AAU — and pulled off a giant operational success. 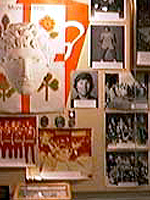 The ’84 Games were magnificent, despite the communist boycott. USA wrestlers captured nine gold medals, three silvers and a bronze. Four of the medals, two gold, were the first ever in Greco. There were 1,408 participants in the Olympic trials, as USA Wrestling events attracted more than 10,000 competitors for the year. But the federation’s new responsibilities, added to those necessary for continued growth, proved to be too much of a good thing. Years of frenzied activity, of budgets overestimating income and underestimating expenses, took a heavy financial toll. Reorganization with a director of finance and a prudent fiscal policy was imperative. When a windfall of profits from the 1984 Olympics and USOC coin program was divided among 38 national governing bodies, USA Wrestling was able to climb out of one hole. But erratic leadership promptly dug USAW into another. Combs had resigned in 1985. First Rader, then sport science expert Jim Scott, coach at Grand Valley State College, held interim positions as executive director. The Board settled on Gary Kurdelmeier, a former coach at Iowa, who lasted two and a half years. He was replaced in 1988 by Wisconsin businessman David C. Miller, gone after two more years. Olympic place winner Jim Scherr, a former NCAA champ;ion for Nebraska and a three-time World medalist, was named executive director in 1990 and steadied USA Wrestling on a new and stable course. Combs’ contributions were not forgotten … he was inducted in 1985 by the Hall of Fame. On March 22, 1987, the Board of Directors voted to relocate the national offices from Stillwater, where they had outgrown their Hall of Fame quarters, to an area with larger population and better access to air transportation. Des Moines, Indianapolis and Colorado Springs were the candidates. Eight months later, the Board chose the USOC’s home town in Colorado, and the move took place in June of 1988. John T. Vaughan of Florida, long-time USA Wrestling booster, member of the Board, delegate to the FILA marketing commission and chairman of the Board of Governors of the Hall of Fame, pledged to keep the museum alive and operating as a separate entity.